Display Case has an outside dimension of 45"L X 12"W X 6.00"D, and an inside dimension of 44"L X 11"W X 5.25"D. It includes a lockable latch for safety. Made of beech hardwood, and acrylic glass door. Wood color options include Oak, Walnut, Cherry, and Black. The Interior color options include Red, Blue, Black, White, and Green. The case comes included with all the hardware necessary to hang it on the wall as well as hardware to mount the shovel inside the case and keep it place no matter which way you hang it. Perfectly accommodates our Deluxe Ceremonial Chrome Head Shovel # SH0002. Please note: It may take an additional 5-6 business days for processing. The Deluxe Chrome Ceremonial Shovel Display Stand features a lustrous chromed steel frame and sturdy stem guard to secure your shovel(s) while on display at your groundbreaking ceremony. This is a perfect alternative to our standard display stands when you want to accentuate the prestige of your event. The stem guard can be adjusted to accommodate almost any shovel and it is easy to latch and unlatch. Made from heavy duty metal, this stand is a must for anyone looking to accommodate their ceremonial shovels. With an adjustable height ranging from 27 inches to 40 inches, and a neck guard to lock the shovel in an upright position, the stand ensures your shovel remains front and center. 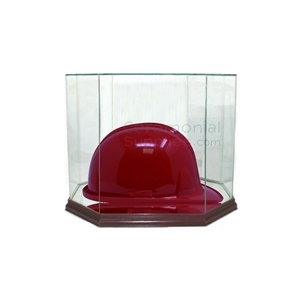 Measuring 14.5 x 11x 11 inches, this display case comes with mirrors on its bottom and back (on the inside) with UV protection to ensure its contents remain pristine perennially. Available in cherry, walnut or black finishes, for an extra fee the inside of the glass can be laser etched with logo and/or two lines of text as well. Takes an additional 4-6 business day processing time. 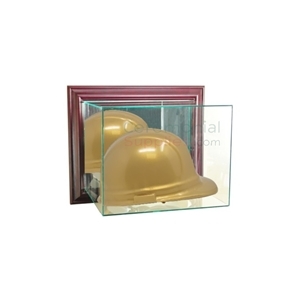 A glass box with inside dimensions of 14 X 12 X 11 inches, this ceremonial hard hat display case features a mirrored bottom and back with UV protected glass. As an option, you can laser engrave your company logo and text printing on the bottom of display at its front. The box is available in 3 color moldings, namely cherry, walnut, and black. Please allow and additional 2-5 business days for processing. 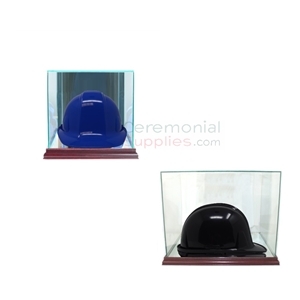 An octagonal glass case with insides measuring 14.5 X 11 X 11 inches, this is a display case to preserve the hard hat worn at your groundbreaking ceremony. The case is UV protected and features double strength glass with furniture quality molding for durability. The base molding comes in either cherry or black, while the bottom and back of the inner case feature a mirrored design. For an additional fee, a logo and up to 2 lines of text can be engraved via laser on the case. May take an additional 4-6 processing business days . The importance of a successful groundbreaking ceremony cannot be overstated. The overall success of the ceremony depends upon how the business is perceived by the attendees; a feat achieved only by the amalgamation of the smallest of details, from the color of the chosen hard hats, to the sturdiness of the ceremonial shovel stands tasked with keeping your ornate shovels upright while displayed at the groundbreaking stage. A business’s commitment to getting the finest of details right, speaks volumes about their sincerity towards the project at hand. A business which takes the time to get the right products to get—even— a groundbreaking ceremony right, can be counted on to make decisions that allow its investors to stand tall with pride. It is a reflection of a company’s focus on quality and culture of prosperity—two things that lead any company to great success if well executed. Shovelling is a crucial element of the groundbreaking ceremony, and while having the right ceremonial shovel is half the work done, the other half is getting a sturdy shovel stand to complement it. Ceremonial shovel stands are usually made of either polycarbonate or metal. Their primary objective is to present the elegant ceremonial shovel in upright position to impress the crowd. At the same time, a ceremonial shovel stand ensures easy access when the big moment comes for the event’s VIPs to perform their first dig. An ideal ceremonial shovel stand should is properly weighted, so as to accommodate the shovels without losing its balance or posture, and they should be properly contoured to fit said shovels in just the right manner. 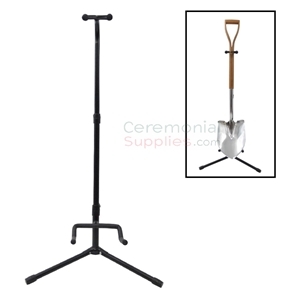 These two qualities greatly contribute to the functionality of the stand, a factor that is highly prioritized by the item’s buyers, because not only is a ceremonial shovel stand crucial during the groundbreaking ceremony, but also after the ceremony. Owing to the celebratory nature of a groundbreaking ceremony, the organizing party might choose to save it as a keepsake, typically accompanied by a plaque or an inscription detailing its place of origin. In such moments, a durable ceremonial shovel stand ensures a safe medium to store and display the ceremonial shovel as a memento. Qualities such as these elevate items like ceremonial shovel stands from background props to indispensable tools that are both, necessary and desired. Just as our patrons possess a sharp eye for detail, our collection possesses a sharp selection of ceremonial shovel stands. 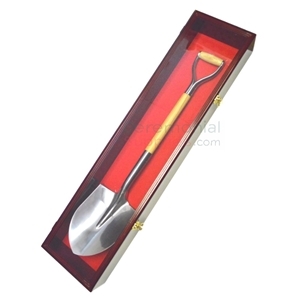 At CeremonialSupplies.com, we understand our clients’ need for quality in groundbreaking products; our ceremonial shovel stands are no exception. As a result of this foresight, we maintain stock of high quality ceremonial shovel stands to complement all kinds of ceremonial shovels. Whether you’re looking for a stand to hold your ornate deluxe wood and chrome shovel or your professional industrial grade metal shovel, CeremonialSupplies.com has the perfect option for you. Shop with ease and find additional items to complement your ceremonial groundbreaking package. We carry all the products you need beyond shovel stands.